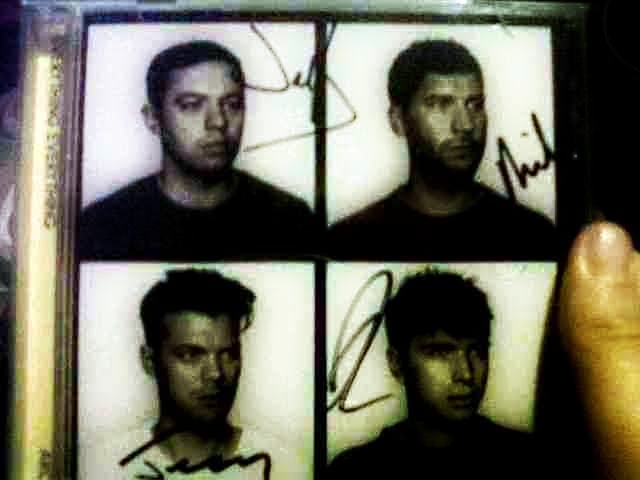 Arc is the new album by Manchester based four piece Everything Everything and is the follow-up to their debut Man Alive, which earned them a Mercury Prize nomination. At the time of writing, it had entered the album charts at number five. For those unfamiliar with their music, they are often labelled as being “indie pop” or “art-rock”, however to me, they are pretty much in a league of their own in terms of their sound. What you’ll note is their fondness for intelligent, witty lyrics that even their most ardent fans will scratch their heads at thinking “great song, but what on earth are you on about?”, and the distinctive falsetto of Jonathan Higgs. I first got into the band about three years ago, when I stumbled upon the video for their track Photoshop Handsome, which someone I follow on twitter had posted the link to. I was hooked the moment I first listened to them, their sound was nothing like I’d heard before. I loved Man Alive and was hugely looking forward to Arc from the moment I first heard Cough Cough (the first single from the album). This album is much like its predecessor except it’s stronger, more assured and less frantic in pace. Everything Everything are not to be confused with Everything Everywhere (EE), the mobile and broadband network formerly known as T-Mobile and Orange that has Kevin Bacon in its adverts. It really isn’t worth tweeting the band moaning about how you’re having problems with your 3G signal. (Tbf, it probably isn’t worth tweeting the company’s account either, but anyway). Favourite tracks from the album – Cough Cough, Kemosabe, Duet, Undrowned, Torso of the Week, Feet For Hands, Radiant, Don’t Try – it’s probably predictable that I have picked the two singles among my highlights of the album, but who cares? Both were brilliant choices and in Cough Cough, you have one of the best opening tracks of any album I’ve heard in some time. Out of the others I’ve mentioned, I feel that Duet in particular must be a single, as I believe it has “massive hit” written all over it. Tracks I’m not as keen on: The House Is Dust, Armourland – it’s not that I particularly dislike these tracks, it’s just that I haven’t really got into them as much as I have the other songs yet. The former is looking like the one I’m more likely to skip at the moment, but it’s probably going to take a couple more listens before I make up my mind on them. Overall, Arc is a brilliant album that is surely set to send Everything Everything into the big league of British bands. Album of the year already? Too early to say, but don’t be surprised to see it in a few “albums of 2013” lists by the time the year is out. N.B. This blog post relates to the standard edition of Arc. There is also a deluxe edition available on iTunes which has six more tracks including an alternative version of Duet (which is just as good as the original) and a remix of Don’t Try plus a short film, Sequence_01, that shows behind the scenes footage of them recording the album.